I couldn't resist it, I needed a log book for my TM470 project and saw this in a stationary shop called scribbler today and had to buy it. It's approximately one hundred pages with ruling on one side and the other side being plain, which should accommodate sketching and capturing of information as I work through my project. I'll eventually have to digitise a lot of the information but it will be a useful thing to have a round. 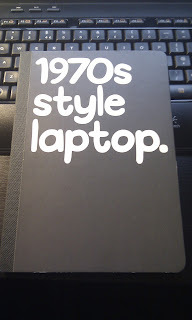 At £6.99 it's certainly the cheapest laptop I have ever bought... and it will never crash!